The most fascinating and frustrating movie star of his generation, Adam Sandler’s career as a stand-up has seemed like a distant memory for a long time. His films have not only faced plummeting critical receptions, they’ve featured an increasingly apathetic Sandler. He seems bored, and it’s impossible to muster enthusiasm ourselves if he isn’t bringing it to the table. At this point, we should be less surprised if Sandler turns in a good dramatic performance (he was robbed of an Oscar nomination last year for The Meyerowitz Stories) than if he really put his all into a comic one. But Sandler started his career as a goofy kid whose primary skill was his ability to disarm you. He still has the capacity to surprise. And having left Sony for the freedom promised by the Netflix experiment, his new comedy special is the first of those projects that actually feels experimental. 100% Fresh is incorrectly named. Not because it isn’t good, but because it suggests a tone of ironic bitterness that isn’t represented in the special. Directed by Sandler’s frequent collaborator Steven Brill (with some sequences filmed by Paul Thomas Anderson), 100% Fresh contains one small dig at Rotten Tomatoes (an aggregate website that collects reviews from outside sources), but is otherwise shaggy, earnest and inventive. Sandler grins and mutters his way through it all, but he seems to be having fun, and it unlocks much of his old charm in an instant. It can also be a jarring, almost schizophrenic hour. 100% Fresh resembles a documentary more than a comedy special. Specifically: And Everything Is Going Fine, Steven Soderbergh’s portrait of the life of the storyteller and performance artist Spalding Gray made up entirely of existing footage. 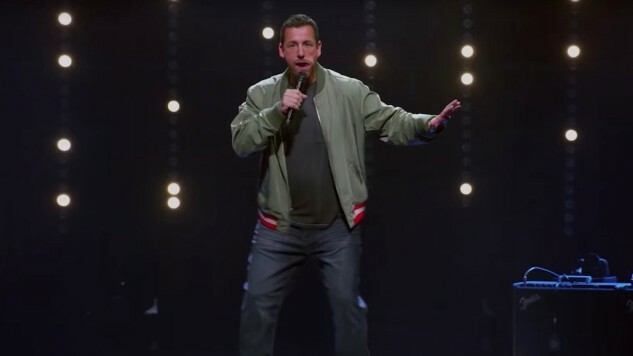 Brill similarly leaps from performance to performance with Sandler, transporting him from a scrappy non-set to a huge concert hall and everything in-between with a series of jarring cuts and thoroughly bizarre interstitial segments that feel like something Sandler would only be making at 52 if he’d had an entirely different career. This tactic sometimes feels like flash for flashiness’s sake, but it ultimately strips the show of the narrative we might impose onto it and allows it to become the hangout special Sandler wants. The possible thesis for why Sandler is doing this is only revealed later. As for the content of the special, Sandler’s giggling rubs off on you. The off-kilter songs are back, with lyrics like “I guess that calls for a death pillow over your face.” There are duds every once in a while. A song (presumably) called “My Uber Driver Smells Bad” is a terrible representation of Sandler’s otherwise savvy ability to observe little everyday discomforts. Rob Schneider pops up in a cameo that’s initially an unwelcome reminder of the repetitive casting of Sandler’s recent œuvre. But then Sandler does a song about Chris Farley. It’s funny, sweet and sad. And when he sings “I wish you were still with me, and we were getting on a plane to go shoot Grown Ups 3,” it’s chilling, but also humiliating. Because somehow we never thought to think about how a guy who lost someone so young like that might want to spend his adult life making as many movies with his closest friends as possible. If 100% Fresh doesn’t give you the kind of laughs you like, it will at the very least provide that perspective.